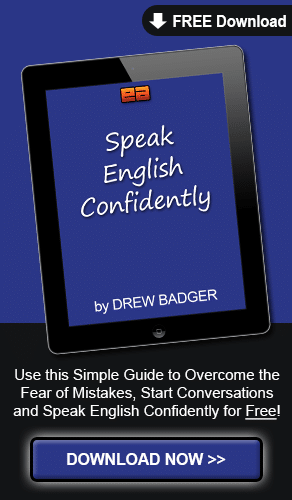 Learn how to develop English speaking confidence in episode 10 of the Power Learning Podcast! In this episode of the Power Learning Podcast, I’ll reveal one of my best strategies for becoming a great speaker – how to create your special “English Fluency and Speaking Confidence Suit”! Learn how to protect yourself and turn improvement into a game with this great English language learning and practice technique! Well, hello and welcome back to the EnglishAnyone.com Power Learning Podcast. I’m Drew Badger, the cofounder of EnglishAnyone.com. I’m an author, a teacher trainer and an English speaking confidence expert I’m so excited to have you with my here today for the 10th episode of the Power Learning Podcast. So welcome, welcome and I hope you’re having a fantastic day. Today, I want to talk about something that’s incredibly important and also, uh, something that most people, except for maybe a few of my private students know about me and know how I got for, uh, for trying to improve my Japanese and, and learning how to become a confident, fluent speaker of Japanese. So today I’ll be talking about something that was very important for that. Something different you’ll notice about this podcast and you’ll notice for the next couple of months is that it will not be shared with the four winners of the Master English Conversation Scholarship Contest. I’m giving them, uh, six months to kind of train and work in the dark, uh, so they will not be coming on every podcast episode with me one time a month, uh, but they will be still sending me recordings and so I’m still tracking their progress, uh, and helping them and working with them every month as they continue to get fluent. So they’ve already been on the program, uh, for seven months now, uh, and I’m really excited with their progress and all of the great things that they’re learning, uh, and I’m so excited to see what they do after a full year. So when the full year ends with the scholarship contest, after all of the winners have finished with their full year, then I will have them come back and we’ll do some more recordings and we’ll see. We’ll be able to check their progress and see just how much they’ve grown and how much they’ve developed their fluency over the course of a year. So I’m really excited to do that. But for now, it’s just me. So you get to sit back, relax and enjoy listening to my lovely stereo voice on these stereo microphones. Yay, yay. I love playing with these things. Anyway. So let’s get into what I want to talk about for today. For the Master English Conversation Scholarship winners, we started at the very beginning with very, very broad ideas about fluency and now we’re getting into much more specific things. A few months ago, we talked about grammar and then, last month, a little bit about pronunciation and now, for the rest of the time, I really want to focus on speaking strategies and how you can get out and meet native speakers to practice with. So, today I want to talk about kind of the, uh, fundamental way of building confidence and learning the skills that you need to master through speaking practice and the way to train your mind so that you can become a much better speaker, much faster. So let’s get into it. One of the things I hear from students most, especially when they’re just starting to master a few new phrases and they’re learning some words and they really want to get out and speak, uh, a problem that a lot of people have, and it’s the same thing that happened to me when I started learning Japanese is I was really, really nervous about making mistakes, uh, and I didn’t want anybody laughing at me. And, you know, this is a, uh, a typical thing, uh, and learning a language is such a special kind of thing to learn how to do because it really takes you back almost to your childhood level. And you could be a, like a, a rich and powerful and successful person, but when you try to learn a new language, it’s like you become a baby again. And for young children that are learning a language, they don’t really have this problem. We call this a hang-up, a hang-up. It just means having, uh, like a problem or something that you’re thinking about that stops you from doing something. So I believe, “Oh, I’m so successful and powerful. Why am I not able to learn a language, uh, or I should be a lot better at this and I’m, um, starting to doubt myself and lose confidence in myself.” So this is a very common thing that happens. It happened to me and it happens to pretty much everybody that learns languages, especially if they’re not two or three years old when they’re learning for the first time. So especially for adults, and this is mostly who I teach with this podcast, but certainly anyone’s welcome to listen, but this is mostly for adults because it’s a special thing that we go through because we went through learning languages naturally, growing up. And now that we’re going back again, it’s almost like we’re revisiting childhood. So, when we kind of go back to childhood and, and try to think about how we can learn a language again, to deal with the frustration and the lack of confidence that we get because we make so many mistakes, one of the things that I did that was really helpful for me and it’s been helpful for many of my personal students, uh, is to create a kind of gigantic fluency suit, almost like a powerful robot that you climb into when you begin practicing. Right now, it is the middle of September almost, September 2013. So, if you’re listening to this in 10 years or so, the reference will be a little bit dated, but not that long ago, the movie, Pacific Rim, came out. And this is kind of a classic, um, from the Japanese culture, a giant robot that’s constructed to go out and battle these intergalactic monsters. And, you know, it’s a fairly common theme that many children, even in America, would know and many other countries as well, um, because this theme is common. It’s just a, uh, a cultural thing from Japan that became popular worldwide. But I really want you to use that and this is, again, a giant robot that you climb into and you become a much more confident speaker by focusing, uh, anything negative or, uh, any bad attention, anything like that, on the robot. The reason, uh, I talk about this as a way to get better at fluency is because there’s a special thing about fluency where there’s kind of two things. One is that you’re needing to protect yourself because it can be really frustrating and a suit is almost, uh, kind of a great way to do it. So it’s like you’ve got armor to protect yourself. And you have to recognize that getting fluent is like any other difficult skill, like learning now to ride a bike. And it’s not that you’re stupid or you’re bad because you don’t know how to ride a bike. It’s just that you don’t know how to do it yet. It’s, it’s something you have to get used to. So learning how to, uh, ride a bike is kind of one specific skill. You need to learn how to move your body in a certain way. And once you figure it out, it’s really easy and fun to do. And fluency is, is exactly the same way. It’s like riding a bike, but you also have to think about the mental aspect and the fact that it takes a really long time to master another language, especially if you’re an adult trying to learn, mostly for the psychological reasons. But, if you’re thinking about getting fluent and you think about learning a language as a skill that’s a special thing that you have to physically move like a native speaker and you have to think like a native speaker and talk like a native speaker, it’s almost like you’re literally wearing a different suit. And you are going into or fitting yourself into the suit of a different language speaker. So, as you’ve probably seen some, some children, uh, or even friends of yours maybe, when they’re speaking – to give you kind of a clear example, some of my friends back home in America, if like maybe their grandparents or parents even are from a different country, when they are speaking with them, they will actually change. Their personality will change slightly. And even most people, like me when I go home for Christmas or something, I become a little bit more immature because I’m not, you know, the one having to take care of myself. I’ve got my dad or my mom there to cook me a little bit of breakfast or wash my clothes or something. So, getting fluent is the exact same thing. When you step into a different language, you’re really stepping into a suit and you’re kind of becoming that kind of culture. So there’s a person inside that’s you, but then there’s the person, kind of the shell, which is what you show to other people. And this is how you think and how you behave and how you speak. And that’s the whole fluency suit I’m talking about here. But I don’t want you to think about the suit as the same size as you. I really want you to think about your fluency suit as massive. It should be huge, just like those suits in the movies and TV shows and cartoons that you’ve probably seen before or you remember from your own childhood. Voltron is one TV show that I remember that I really enjoyed and this is a couple of people in different suits and different lions and they come together to make a giant robot that can fight different stuff. And there’s a real sense of power that comes from that and it will help you build your confidence. But the most important thing is that, being inside the suit, you don’t have to believe that you are stupid or that you are doing anything bad or that you are the one that’s making all these mistakes. It’s that you haven’t learned how to operate your suit yet. So imagine yourself, you’re just kind, you’re like in, uh, like an army or something like that and you just received this suit for the first time and now you’re trying to use it properly. You don’t even know how to move the arms or walk around or look around at things. Everything is new. And this is exactly what happens when you’re learning a new language. So, when you think about these things, a lot of people think that they are the one that’s bad and they’re stupid or something like that when they can’t remember things. And I really want you to realize that you learning to become fluent is you learning to operate a suit for a different language. And that’s basically what’s happening. And if you remember that, uh, it’s, it’s not like you are bad. It’s just that it’s a skill that you need to learn. It’s just the, the thing about learning languages is that people become especially sensitive because it’s such a physical thing because you are the one speaking. You are the one moving. And, and, if you, if you don’t do it properly then people think they, uh, themself, uh, the person speaking, is the one really bad. So I want you to think about the robot for the reason of protecting you, but the other really fantastic fun reason to create this robot for yourself is because it turns fluency into more of a game. And you can get inside your robot, like every day I walk outside and when I step outside of my apartment here in Japan, I am strapped into my suit and I walk around, uh, and I think about all of the different activities I can do that can build my skills and help me level up. Now, this term, to level up, this is very common in video games. And when you level up, you learn a new ability or you’ve beat some really difficult challenge and you boost your confidence. 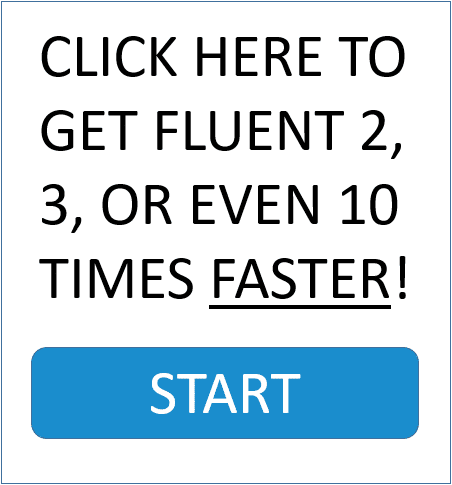 So you can do the exact same thing with your fluency. So, instead of thinking about learning a new word or a new phrase, you’re really boosting the power or the ability of your robot. And, once you have these abilities, you will never forget them. So it’s, uh, it’s something really important for me as a teacher and this is why I always tell students it’s much better to master a few things than to try to learn hundreds and hundreds of words that you’re never going to use or you probably won’t remember. So when you think about your robot, like let’s say I am going out and one phrase I want to practice is ‘what time is it’? I will put on my robot suit and I will walk around to everyone and, and I will practice my Japanese and I will say, “What time is it? What time is it? What time is it?” Even if people are not wearing a watch or anything, I want to say, “What time is it?” I will walk around and I’m kind of learning one particular skill or one particular phrase. And as I’ve seen it and I’ve used it so many times, now it becomes a thing that I master. So remember that languages, it’s really a collection of a whole bunch of different skills. And, when you see people that can speak really, really well is that they’ve taken the time to master all of these individual words and phrases and then they’ve learned to put them together seamlessly. And the only way to do that is to go out and practice and that’s really it. So, if you make it more of a game and today I want to level up my ability to blend sounds or to use other words or anything like that, that’s really what’s going to help you become a fantastic speaker. Now, as you’ve got your robot suit together, I really want you to think about the color the robot is and think about how big it is and the design of it. What does it look like? Put some really cool spikes or other, you know, colors and things like that on the robot suit. Give it some character and really imagine yourself stepping into this thing. And even opening and closing your hand, all of these things, they remind you of just how difficult they are, but that you can practice and focus on each individual thing and really master that. And when you do that, it will build your confidence slowly over time. So, just like a baby, uh, a baby is born without knowing how to use its eyes properly. So a baby has to learn how to focus and open and close its eyes and look at things. And it’s something that we take for granted now. We don’t really think about it and we don’t think about it as something that’s a big deal. But even walking around, a baby isn’t born knowing how to walk around. And it’s not that the baby is stupid. It’s just that the baby has a suit and it has to learn how to use it. So you are the exact same way. So it’s not just learning the physical movements of something, but it’s also how you act, um, and what you talk about and what you think about. And so, all these things together, this is really what makes up your suit. So, design it. Come up with your favorite color. Really get a good picture for what your suit looks like and then step into that suit anytime you have to use your English. And remember that, if anyone laughs at you for doing something, you can laugh along with them and you can say, “I know I’m, this is kind of my fluency suit and I’m, you know, not so good at using it yet, but I’m working hard at doing that.” And people will think that’s a great idea. People will think that’s very cool. So, when you go out, put your suit on. And you can start working through kind of the order of things, which I’ll go through right now to help you build your fluency much faster. Now, in thinking about leveling up your suit, there’s a particular order that you want to go through and learn things in. And this is really important and I want you to remember this so I’ll go over it in detail today. But, thinking about the opposite of that, what a lot of people do is they’ll learn backwards and they’ll learn backwards because this is how they were trained in school to learn languages. Most people, when they’re learning English, they learn lists of vocabulary words and they learn grammar explanations and things, but in their own language. So what they do is they learn how to translate things, what they want to say first and then they translate it in their head in English and then they finally speak. So this is really, really frustrating for people, uh, and again, the reason it happens is because of how you learned English. So you have to kind of unlearn a lot of those things as you’re building your fluency suit and think about leveling it up the right way from the beginning. So the first thing you want to do is to really focus on your grammar. Uh, I know people don’t like studying grammar and I don’t really like, uh, using grammar rules when I’m teaching people either, but it’s really important that you master grammar, even if you don’t know what every grammar point means. So I, I really want to make this very, very clear because a lot of people think that, uh, you shouldn’t study grammar. But the truth is, you need to study grammar and I recommend you study grammar, but it’s all about how you study grammar. If you learn the rules for something, as opposed to seeing grammar in action and learning it naturally, then it’s going to be really, really bad for you because you’re training yourself to learn it in the wrong way and this is what most people do when they’re learning languages. Uh, and this is not just for learning English, but for anything else. This is basically the way typical language education is. So the first thing you really need to do is master grammar. And there’s lots of ways to do that, but it should be seeing examples of the grammar over and over again and then seeing stories where you can take grammar, uh, and you can create your own stories this way, but you take a story, like “I go to the park,” and you try to tell it in different ways. “I went to the park, I will go to the park, I was going to the park.” Those kinds of things. And, even if they sound boring, just think of it like you’re practicing your robot. So you have train. You have to make it a game. You have to make it more fun an interesting, but these are the things that you have to go over. So grammar is more important than anything else you’re going to have to master as far as the specific language goes and the functions of the language and using the language because, if you don’t understand grammar and you know a few words, people will actually think that’s worse. So I know so many students. They know some weird word or some word that they looked up in like a TOEFL book or something and they remember that word, but they can’t actually have a conversation where they speak confidently. And it just shows that those students are not, uh, they kind of have the wrong priorities. And it’s okay if you’re just trying to pass a test. That’s just fine if you want to study that way, but if you want to become a great speaker, you can’t sit and look up words in a TOEFL exercise book and then expect to become a great speaker that way. What you have to do is master the basics of grammar first and then you can go out and really start seeing progress because you stop thinking about the grammar rules. All you do is learn the grammar naturally by telling stories and seeing things in context over and over again so you learn how grammar works without needing to know the name, uh, or some explanation of what that grammar point is. Honestly, if I walk outside and I’m in, uh, in America or England and I ask people the name, uh, of a certain grammar point, they wouldn’t be able to tell me what it was. But a lot of people that are learning English can. And the, uh, the kind of sad part or the irony of that is that, even though they can tell me what a grammar point is, they can’t use that grammar point successfully in a sentence. So, if we’re thinking about your, for your suit, master grammar. That’s the first thing you want to do. These are the basic functions of your robot, learning how to move it properly. Uh, the next thing you want to go into is learning phrases and words that can be used in an English sentence and an actual English sentence and you can get these from movies and TV shows, if you’re at that level. But the important thing here is to master these words and phrases as one continuous unit. When you learn just how to write or read one particular word, that’s just fine for a test, but in regular conversations, native English speakers are blending the sounds of words together, just like you do in your own native language. So begin with grammar and then, once you’re mastering those things, go out and start learning lots of phrases. You can learn them in books, um, you can get them from TV shows, whatever, but you want to pick one phrase and go out and use that phrase as often as you can. Uh, so when I was practicing my Japanese, I went to the grocery store, uh, and I’d say, “Where is this?” or “Can you tell me about that?” or any other phrase that I’m practicing. And I would use that over and over and over again. So even though it might sound kind of boring to you and you might not want to do that practice with the same person, if you can find different people to practice with, and it can be online or in person, that’s what’s going to help you become a fluent speaker of English much faster. After you’ve built up your words and grammar, then you really start getting into pronunciation and you’re doing that because you can speak much faster and you can understand native English speakers. So, the first thing you really need to do for pronunciation is really listen to lots of native speakers, lots of different people speaking the same thing, uh, and then you can start getting a sense for what kind of voice you want to have for your own pronunciation. So you’ll notice now that your suit, you’ve mastered the grammar, these are the basic movements of the suit. You’ve mastered kind of slightly higher-level things, like being able to jump and fly and run around. These are like the phrases. And now you’re getting into the pronunciation. This is where you can do all kinds of fantastic things. Maybe you picked up like some missiles or something or some cool laser guns or something like that, that you can do. Uh, but you’re moving way, way higher into really mastering that robot suit. And that’s what’s going to make you, uh, a fantastic speaker. So as you listen to a lot more people, uh, and you’re understanding them because you’ve mastered the phrases and the grammar, that’s what’s going to help you become fluent much faster. And then, finally, the last thing you’re doing is really getting into the culture and meeting native speakers, uh, and becoming friends and building real deep, lasting relationships with people that will be with you for the rest of your life. And these are the things that really help you become indistinguishable. This is basically the exact same thing as a native speaker. So you’ve got great grammar, even though you, uh, make mistakes sometimes, just like native speakers do when they speak, and then you can go out and meet new people to practice with and you’re making friends and you basically become a native speaker. You’re indistinguishable from a regular person. So, if I’m speaking with you, you wouldn’t know, um, if I’m speaking Japanese fluently or, uh, you know, speaking Italian or whatever the language is that I’m speaking. But again, the, the whole idea here is, number one, to remember that, that it’s how you learned the language and now you need to unlearn that and then you need to kind of put on your suit and start learning things in the right way in order to get fluent faster. So stop trying to think about all these big problems, like, “Ah, I can’t speak and I can’t do this and I can’t do that.” Just focus on one thing. Focus on one grammar point and master that. Focus on one phrase and master that. And then, over time, you’ll see, wow, I have a suit that I can use. Uh, and you become fluent much, much faster that way. So stop worrying about big problems. If you’re still having problems with, uh, the kind of small things, like learning grammar and all the, the fundamental things about learning a language. And, as you master each one of these skills and perfect your robot, then you really start building your confidence because confidence comes from each of the small successes that you have and it changes the way you think and the way you behave and it builds on itself. And, after a time, you don’t need the robot suit anymore. So you can finally kind of take the robot suit off and now you are finally the one that has learned how to speak and you become the fantastic one. You become the amazing speaker. So when you’re not doing so well, it’s kind of the robot’s fault and it’s just something that you don’t really know how to operate yet. But, as you get better and better, it becomes more your responsibility and you become the one who’s a good speaker or a bad speaker. So when you get out, think about these things. Make it again. Make it fun. Find your robot suit and that’s really what’s going to help you become a fantastic speaker. I can’t say it enough. Learn things in the right order, get out and practice. Master a few things instead of trying to worry about a whole bunch of different phrases or sitting down, uh, and learning 500 words from a TOEFL book that might help you pass a test, but it’s not going to help you become a faster, more efficient, fluent, relaxed speaker. So think about all these things, as you go out. Design your suit. Get out. Have a fantastic time learning and practicing your English and, if you have questions, feel free to comment down below. I really look forward to hearing from you, uh, and to helping you get fluent, if there’s anything I’m missing, uh, in making these podcast episodes. Have a fantastic day. Enjoy your suit and I’ll talk with you next time. Bye bye.